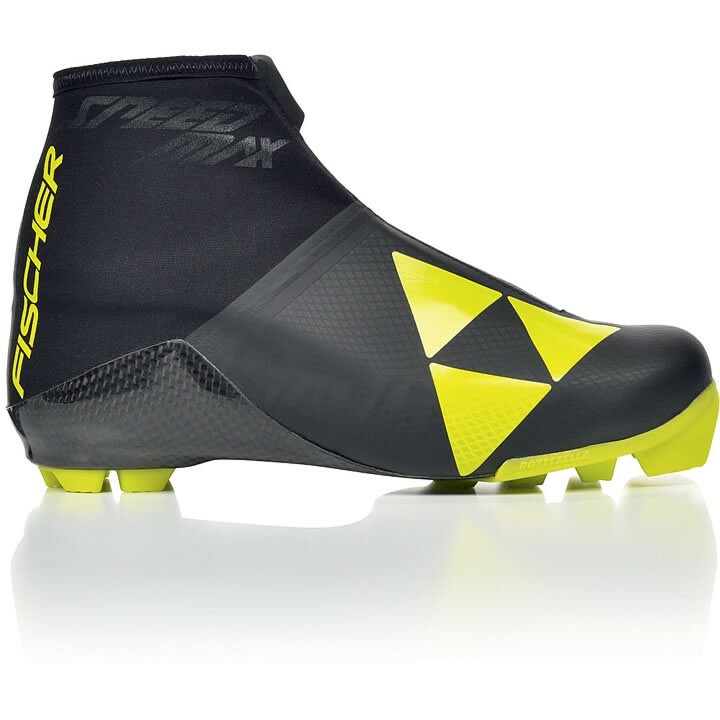 The new Fischer Speedmax Classic boot is an ultralight high-end race boot with a 3-Dimensional carbon shell. This top RACE CODE model was developed together with Fischer and their World Cup pros. Maximum side stability and breathtaking power transfer with a harmonious rolling action. The champion takes it all. SSR: Two-part construction means 50% saving in weight compared to Xcelerator Skate Sole and forms the perfect entity with Integral Carbon Chassis. Fischer Speed Lock: New, revolutionary quick lock with minimum size and weight. Simply pull the laces tight and that's it. The system is safe and reliable. Easy Entry Loops: Practical entry loops and wide opening designs guarantee that boots can be put on/taken off comfortably. Thermo Insole: Insole with fleecy top layer and aluminum-lined lower layer for ideal insulation to keep out the cold. Cleansport NXT: A natural, chemical-free enzyme system that works to control odor on insoles. Integral Carbon Chassis: Outer sole, insole, and side stabilization elements manufactured from the same sheet of carbon. For previously unattained light weight with optimum stability and power transfer. Hi there! Is there a particular size (s) are you looking for? Thank you for your inquiry. While Fischer boots are produced in whole Euro sizes, Salomon boots are produced in increments of 2/3. For example a men's 11 in Salomon would equate to a 45 and 1/3, where as it would be a 45 in Fischer. If there is a specific Salomon or Fischer boot you would like additional sizing information on, please do not hesitate to contact one of our Nordic experts at (802) 658-3313.